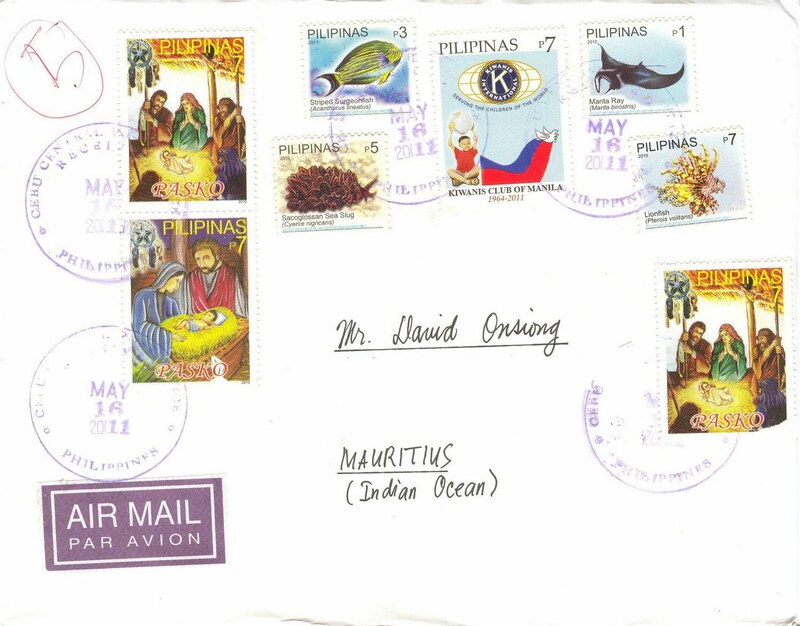 Here's another cover from the Philippines with marine life definitive stamps affixed on it. The P1, P3, P5 and P7 stamps illustrate the Manta Ray (Manta birostris), the Striped Surgeonfish (Acanthurus lineatus), the Sacoglossan Sea Slug (Cyerce nigricans) and the Lionfish (Pterois volitans) respectively. The three P7 stamps, on the left and on the right of the envelope, are on Christmas (Pasko in Filipino). The first one depicts the Magi, also referred to as the (Three) Wise Men who were a group of distinguished foreigners who are said to have visited Jesus after his birth, bearing gifts of gold, frankincense and myrrh. Teh second stamp represents the commonest scene of the Nativity: newly-born Jesus surrounded by Virgin mary and Joseph.